If you already know what the exam is all about, jump right to the tips. 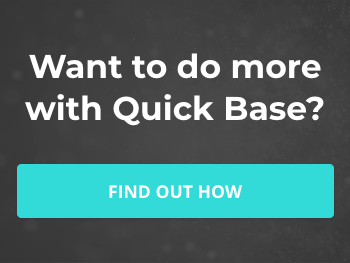 For those of you wondering what the Quick Base Certification is all about, below is some information from the Quick Base University along with some of what I learned from asking QuickBase support. The Expert Builder Certification: A 1-hour, 60-question exam for advanced builders capable of building apps and training others on how to maintain those apps. 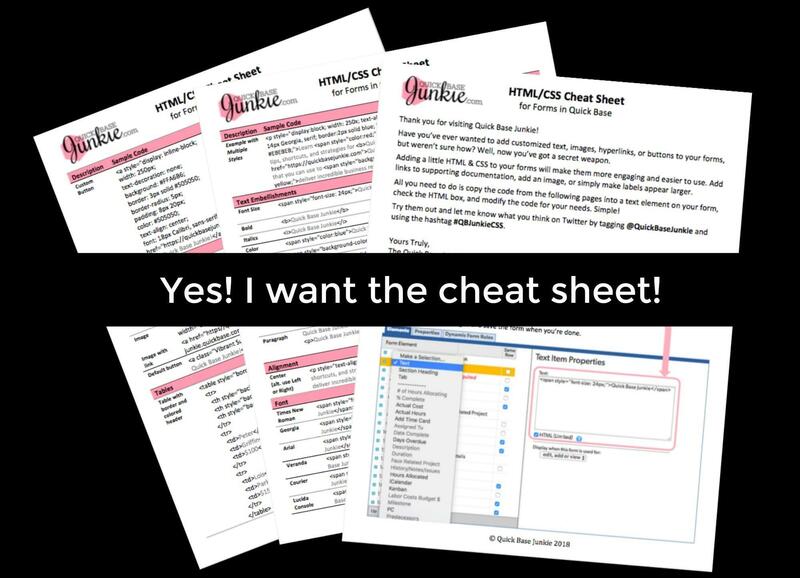 If taken separately, you do have to pass the App Builder Exam before you can take the Expert Builder Exam. For details on the App Builder Exam check out my post on Passing the App Builder Exam. 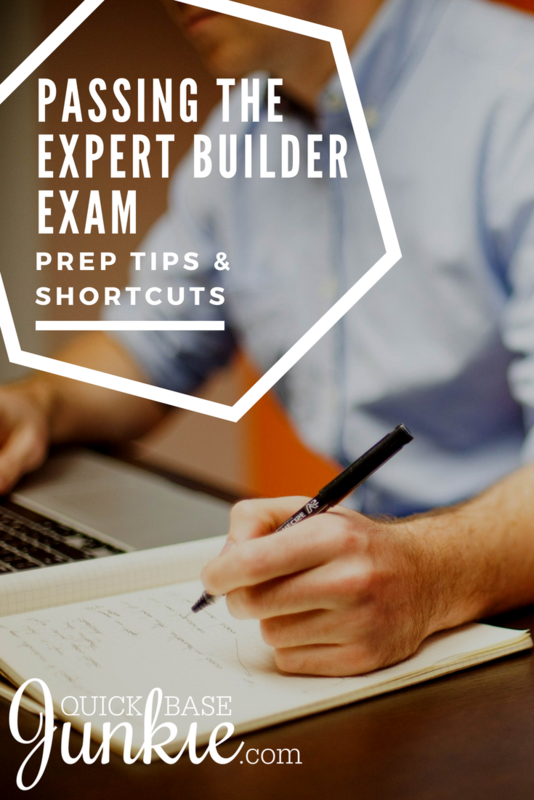 Read on for the low down on the Expert Builder Exam. The exam itself is not organized into neat sections of topics, but Quick Base has provided a list of topics that exam questions are pulled from. Looks simple right? Wrong! This short list is quite deceiving. Brush up on field types and conversion functions. The Quick Base Univesity course on Advanced Use of Formulas does NOT go into detail on the various conversion functions that might be necessary for a formula based on the functions being performed and the field type. Also, spend time reviewing and practicing with different date functions. You'll be happy you did! I was surprised to see Sync included in both the App Builder Exam and the Expert Builder Exam. I hadn't used Sync much at the time I took the App Builder Exam, and the little poking around I did didn't prepare me for the questions then. So, this time I spent a little more time working through the three Sync examples in the Quick Base Univesity course Complex Workflows and Automation. It wasn't enough. Take the time to work through the various types of integrations especially those having to do with email and pay attention to the options and features in each. Don't be fooled! The Quick Base University course on Record Archiving and Snapshotting does NOT cover the snapshot field setting. You'll want to check out the How to Set up a Snapshot help article and practice a bit if you are unfamiliar with this field setting. If you found these exam tips useful be sure to subscribe to receive more tips like these! Get to know the most common APIs. The Quick Base University course API Bootcamp covers just about everything you'll need to know in 40 mins. It also covers a lot of details on the API_DoQuery, which is probably overkill for exam prep, but useful none the less. I wouldn't spend too much time working with formula variables (if you're not already familiar with them). Practice using just the most common functions and don't waste time with the more obscure ones. If you're already familiar with the functions and operators listed below, you're good to go. Note that this list does not include the conversion or date functions mentioned above. Functions: Min, Max, Average, Case, If, List, Part, Left, Right, NotLeft, NotRight, IsNull, Begins, Contains, and Length. Operators: And, Or, <>, <, >, <=, >=, and all standard math operators (+, -, / , and *). I didn't do much additional prep for Actions, Archiving, and Webhooks beyond what is included in the Quick Base University's Advanced Training Series. Work through the examples in Quick Base and understand the basic capabilities, limitations, and features of each. Also, be sure to pay extra attention to how to troubleshoot and maybe even cause some errors in your webhook examples to see how/where they appear in Quick Base. If you found these exam shortcuts useful be sure to subscribe to receive more tips like these! Don't get hung up if you see a formula in the exam that isn't technically accurate due to capitalization or other nuances. As a more seasoned app builder, you've undoubtedly gotten an error for not appropriately capitalizing your functions. Such as using "Totext" and not "ToText." It seems the exam writers took a few liberties with this formula requirement. Similarly, there may be a mixed use of including the parentheses after the function when listing possible answers. Such as "Case" vs. "Case ()." Don't let this throw you unless you see missing parentheses in a formula you're asked to troubleshoot for errors. With proper preparation and practice, you'll be able to pass the exam no problem. Once certified, Quick Base provides you with a downloadable PDF of your certification, a clickable certification for your LinkedIn profile, and depending on your account, your company may also be notified and award you badges. Now that's cool!